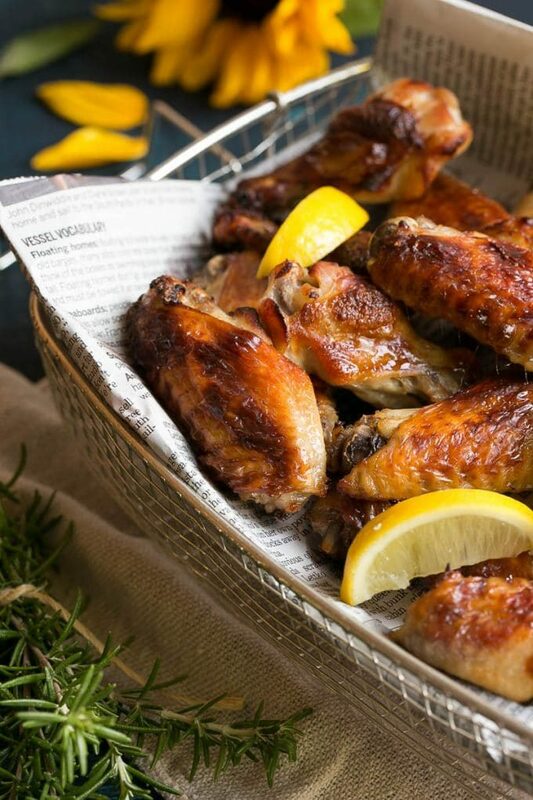 These baked lemon chicken wings are brined, then roasted to crispy perfection. An easy dinner or appetizer option! Chicken wings don’t have to be fried in order to be ultra crispy. This version uses a lemon and herb brine which adds tons of flavor and creates a super crispy wing. Chicken. We eat a lot of it. The girls love chicken so I know that it’s usually a safe choice for dinner. I however crave more variety. When I was at the grocery store I spotted some nice looking chicken wings. On a whim, I decided to forgo our usual breast/thigh combo and buy wings instead, hoping that the girls would approve. Not only did they approve of my crispy lemon chicken wings, they loved them! This recipe is now part of our regular dinner rotation and the girls happily eat it every time. 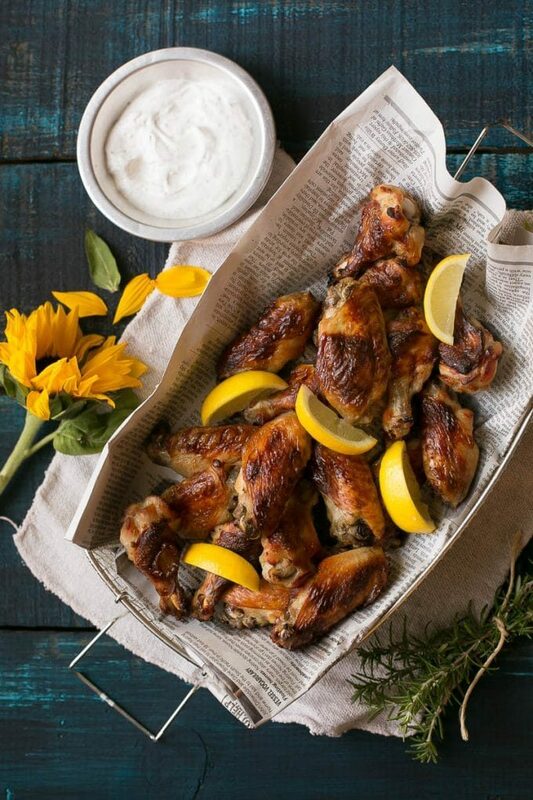 How do you make lemon chicken wings? These crispy lemon chicken wings are baked not fried, but you’d never know it because they come out of the oven super crispy. I use a simple lemon, honey and rosemary brine to flavor the chicken and it’s the ingredients in this brine that make the wings deep golden brown, almost caramelized. So here’s the deal: make the brine, drop the chicken wings in, come back a few hours later then roast at high heat and serve. I recommend my ranch dip on the side but you can certainly eat them plain too. I buy the party wings where they’re cut into two pieces, my girls eat all of the drumettes and leave the other pieces behind for me and my husband. If you’ve never tried brining chicken before, now is definitely the time to start. It adds so much flavor and moisture to the meat. That being said, it is possible to over brine your meat, so it’s important to stick to the time guidelines in the recipe. 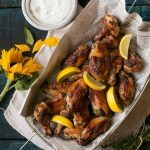 These crispy lemon chicken wings are a great choice for dinner and they also make a fun party appetizer. Who needs a deep fryer when you can bake your wings and get the same result?! 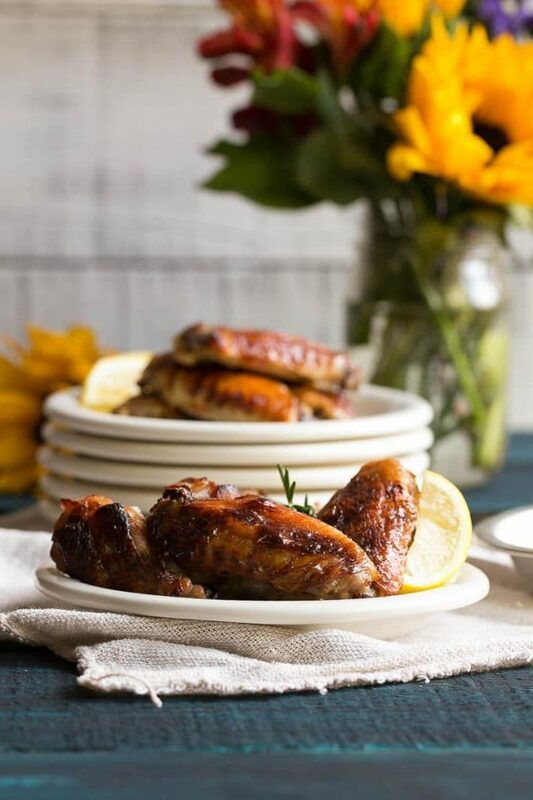 These crispy lemon chicken wings are baked not fried and are perfect served as a main course or appetizer. Bring one cup of water to a boil (I use the microwave) and pour the water into a very large bowl. Add the salt and honey to the water and stir until the salt has dissolved. Add the garlic, bay leaf, rosemary and peppercorns to the bowl. Add the lemon juice and the squeezed lemon pieces. Pour 7 cups of very cold water over everything and stir until combined. Place the chicken wings in the brine, cover the bowl and put it into the refrigerator. Chill for at least 2 hours but no more than 8 hours. Preheat the oven to 400 degrees. Line a baking sheet with foil and spray with cooking spray. Remove the chicken wings from the brine and pat dry with a paper towel. Place the wings in a single layer on the baking sheet. Bake for 45 minutes or until wings are a deep golden brown. Serve immediately with lemon wedges and ranch dip if desired. These actually came out nice and crispy, great flavor too. This is going in my rotation. Do you think these could be grilled on the BBQ as well? My hubby lovesssss wings while I prefer boneless…something about having to rip the meat off the bone and get my face dirty. Such a girly girl I am 😉 But I am loving the flavor of these! May just have to try them out for a fun Friday night dinner! These are the most beautiful chicken wings I have ever seen, LOL! Love that these are flavored with lemon and crispy wings are my fave! Gotta try these soon for my lemon-obsessed family! Wow Sara I just finished eating some leftover drumsticks I made, but now I want a do-over so I can have these! I’m intrigued by the brine plus crispy oven goodness. Looking forward to trying this! WOW, Sara. These are really gorgeous! I have never made chicken wings, and I’m sure mine wouldn’t be this pretty if I tried. Great job!! Love wings, especially when they are crispy! Looking forward to trying this one! Yum! These wings look so delicious!! AND crispy!